Background: Concerns has been raised for developing flexible, lightweight, sustainable and environmental friendly energy storage and conversion device to meet the energy demand of the modern society. In the recent past, supercapacitors have gathered much attention as a promising electrochemical energy storage system because of its high power density, excellent cycle life and rapid chargedischarge. The key element for developing supercapacitors is the electrode material. These electrode materials can be comprised of conducting polymers like (polypyrrole, polythiophene and polyaniline) with metal oxides like (RuO2, MoO2, and MnO2) and carbon materials like carbon nanotubes (CNTs), graphene and activated carbons. In this study, we report the synthesis of polyaniline (PANI) and CNTs composites doped with varying concentrations of copper and nickel transition metal ions via in-situ chemical polymerization with a purpose to enhance the capacitive behaviour of PANI. 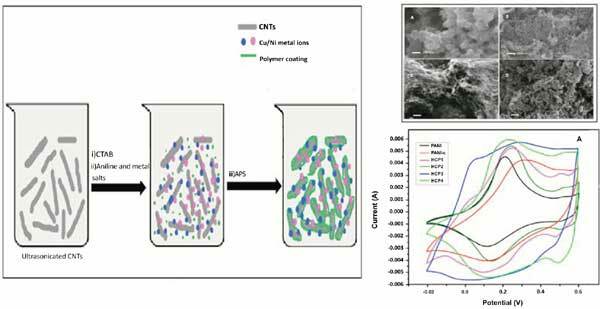 The synergistic impact resulting from the incorporated metal ions, CNTs and pseudocapacitive polymer have been analyzed. Methods: Electrode materials with high specific capacitance have been obtained by coating metal doped polyaniline over carbon nanotubes via surfactant based in-situ oxidative polymerization method. Results: Physico-chemical characteristics of the prepared composites were evaluated by means of FTIR, UV-Visible and XRD techniques. The spectroscopic results confirm the incorporation of CNTs and metal ions in the polymer composites. Also, it has been depicted that the structural backbone of polymer chains has changed very little in the doped polymer composites and a good interaction of hetero atom of polymer with CNTs and metal ions has been indicated. Powder XRD technique revealed the ordered alignment of polymer chains in the composites, additionally, the composites display increased intensity of peaks SEM analysis observed a uniform and porous layer of doped polymer coated over CNTs to yield a nanorods like structure. The capability of nanocomposite electrode materials has been found to increase with the doping level of the metal. Highest specific capacitance value of 1337F/g was obtained for the composite sample with maximum doping level. Electrochemical impedance spectroscopy measurements calculated a minimum solution resistance Rs=1.41Ω for the same composite. Conclusion: Successful design and fabrication of metal doped polymer composites have been achieved. The increment of capacitance has been observed with the increasing concentration of metal ions in polymer composites, amongst various composite samples, the composite having highest metal doping reports highest specific capacitance and a minimum solution resistance. The composite retains 76% of initial specific capacitance at a high scan rate of 100 mV/sec. These valuable characteristics offer good compatibility of these composites for energy storage and conversion systems. Polymer, carbon nanotubes, composites, supercapacitor, electrochemical energy, electrode material.